​Sensei Kevin Funakoshi is a certified Hachi Dan(8th Dan) under Black Belt Hall of Fame inductee and founder of FSKA Shihan Kenneth Funakoshi (cousin to the founder of Shotokan Karate, Gichin Funakoshi also known as the "Father of Modern Karate"). 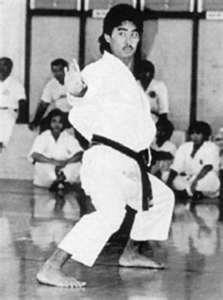 Sensei Kevin Funakoshi started training in 1966 under Shihan Kenneth Funakoshi at the original Hawaii JKA dojo in Honolulu, Hawaii. Following the Funakoshi legacy as a Kumite and Kata Champion at the highest levels of competition Sensei Kevin Funakoshi is now dedicated to bring out the maximum potential from the current generation of Karate students. Sensei Kevin Funakoshi also conducts seminars and examinations here in USA and internationally to affiliate schools as well as non-affiliate clubs. * Cousin of Gichin Funakoshi "Father of Modern Karate"
* Eldest Son of Kenneth Funakoshi "Black Belt Magazine Hall of Fame"